Erma Barlow, who owns and manages Exclusive Cakes, has cultivated a track record in the wedding cake and confectionery business globally. Erma personally caters for all tastes, flavours, and dietary needs (organic, gluten free etc.). Her cake range can be tailored to suit a wide range of styles and budgets. To maintain the higest standards my residence has been approved by the HSE. I am compliant with EU Food Safety Legislation and hold certification from The National Hygiene Partnership for Management of Food Hygiene. Erma is a "City and Guilds" qualified confectioner and was awarded the "British Baker's" challenge cup, Gold Medals and numerous diplomas. She was also featured on the TV programme "Irish Nationwide" which highlighted her beautiful range of cakes and confectionery. With many years' experience, Erma has specialised in exclusive hand made sugar craft flowers specifically designed to suit individual wedding themes. We use all top quality Irish ingredients to make our rich and luxurious old fashioned cakes. All our cakes are handmade using free range eggs and full fat butter. 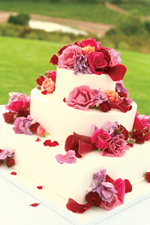 Many of our brides find the cakes so delicious that they will come back for a Christening or Anniversary cake. All cakes are made to the highest standards as specified using only the finest quality ingredients. Each cake is personnally handmade by Erma with great attention to detail; Erma meets with her clients to discuss ideas, themes and provides advice on creating your dream wedding cake. We guarantee not to disappoint as we've had many brides and grooms return for christening, Christmas and occasion cakes afterwards. Exclusive Cakes by Erma Barlow has a preference to deal with customers on a personal basis and will give excellent advice on design and budgetary matters. Erma also makes a full range of celebration cakes for all occasions (Birthdays, Christenings, Anniversaries etc). Erma Barlow welcomes all enquiries and would be pleased to assist with any cake requests. "So why not make that call?" We have a wide range of novelty cakes that we have been asked to supply. We will do our utmost to cater for everyone's needs no matter how big or small. If you have an idea, then Exclusive Cakes will do our utmost to make that idea an reality for you. "Looking for Wedding cakes Cork, Wedding Cakes Kerry, Wedding Cakes Limerick, Wedding Cakes Waterford, Wedding Cakes Ireland, Kids Cakes Cork, Adult Birthday Cakes Cork, All Occasions Cakes Ireland"